Scroll down for an American Flags Clipart and a collection of free, printable U.S. themed graphic designs. This page features links to free printable items with an Independence Day motif. Images include American flags, wallpaper, tattoo designs, coloring pages and fascinating facts about the Fourth. Independence Day is a United States federal holiday that falls on the 4th of July. It commemorates the signing of the Declaration of Independence in 1776, by which America declared its independence from British rule, toward the end of the Revolutionary War. Independence Day in America is most often celebrated with fireworks, parades, barbecues, carnivals, picnics, baseball games, and other traditional American activities, as well as numerous patriotic displays and performances. * The current U.S. flag features fifty stars, each one representing an American state. 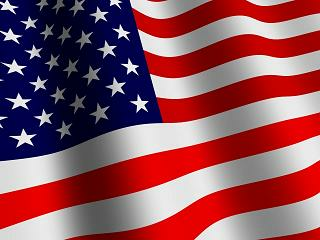 The U.S. flag also has thirteen stripes, each one representing one of the original thirteen colonies. * When an American Flag is redesigned, the new version is first raised on the following July 4th. * The last redesigning of the American flag occurred in 1959, when Hawaii was designated a U.S. state. * The field of blue occupying the upper left portion of the U.S. flag is known as the "canton." * The words "under God" were added to the Pledge of Allegiance in 1954. * When an American flag is flown at half staff, the flag is first raised all the way to the top, then lowered half way down. * It is illegal to deface or destroy an American Flag. For more American Flags Clipart, visit any of the links shown below. THE STATUE OF LIBERTY links to a page with facts and photos of America's most famous landmark. Visit this link to read a brief summary about the history and construction of the Statue of Liberty. AMERICA COLORING PAGES links to a page of free printable coloring sheets with a distinctive U.S. theme. OLD AMERICAN FLAGS reveals a collection of printable images depicting the evolution of the United States flag. Print images of the U.S. flag in all its previous glory. FIREWORKS CLIPART is a page of printable clipart featuring exploding sparklers, bottle rockets and more. A nice added touch to your holiday stationery. MORE AMERICAN FLAGS CLIPART is a collection of patriotically themed images featuring stars, stripes, red, white and blue.